The shores and ocean waters were stained a blood red as the annual dolphin slaughter in Taiji, Japan commenced. As of late-January, over 250 dolphins were netted this month, including a very rare albino calf. Another three dozen were killed for their meat, and the killing, despite media reports to the contrary, continues. The Taiji dolphins suffer an unspeakably savage death. In shallow waters fishermen stab the dolphins with metal spikes through their blowholes. It usually takes several strikes to sever the dolphin’s spine. It’s a slow, painful and soul-wrenching death. It often takes as long as 30 minutes before the dying dolphin inhales its final breath. The helpless animals are driven to the killing cove by boat, made infamous by the Academy Award-winning documentary The Cove, in a barbaric ritual that is void of even the slightest ounce of compassion. This year, after five horrific days in captivity, families of bottlenose dolphins were ripped apart, mothers screaming in agony as their babies were stolen away. Others fought to get free, only to be corralled back into the cove. Currently the International Whaling Commission (IWC), the toothless non-governmental body that oversees whaling activities, does not protect dolphins and porpoises, which is why Japan can kill dolphins by the thousands with impunity. In fact, the IWC affords no protection for nearly 90% of all cetacean species. While Taiji may be the most notorious of the hunts that takes place in Japan, many other killing operations are equally cruel. These ruthless Japanese “drive hunts” murder nearly 20,000 dolphins, porpoises and small whales every year. Activists noted that this winter’s Taiji slaughter was one of the largest in years. In all they reported at least 50 “show-quality” specimens would be shipped off to aquariums around the world from China, the Middle East to inland Mexico and beyond. The animals fortunate enough to avoid being killed for their meat were released back to sea, where they will spend the rest of their emotionally traumatized lives. 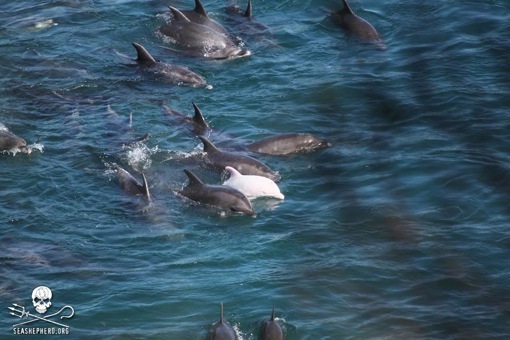 Baby albino dolphin, another victim of the “drive hunt” at Taiji. Photo: Sea Shepherd. The albino dolphin, named “Angel” by long-time activists Ric O’Barry and Karla Sanjur, was first spotted as she swam nervously alongside her mother into the cove. Soon after the first sightings of the pale white Angel, she was netted by Japanese fisherman, taken from her pod, and, as of this writing, remains locked inside the dreary Taiji Whale Museum, where she waits to be sold to an aquarium that will put her up on display, no doubt marketing her unique skin tone. International pressure is mounting in hopes of putting a halt to the murders and kidnappings of Taiji. US Ambassador to Japan Caroline Kennedy, daughter of JFK, expressed her dismay on Twitter. “Deeply concerned by inhumaneness of drive hunt dolphin killing. USG [US government] opposes drive hunt fisheries,” tweeted Kennedy, who was nominated to her post last November. It was a first for a US government official to criticize the hunt. Dolphin killing in Taiji. Photo: Robert Gilhooly. Some have denounced Kennedy and others that oppose the mass killing as cultural imperialists, even though the practice has only been going on in Taiji since 1969. Why is that? It’s true that marine parks in the US are guilty of exploiting marine life, as well documented in the 2013 film Blackfish (snubbed by the Academy), which exposes the dark reality of SeaWold, where cruel entertainment is passed off as conservation. Even so, this reality doesn’t diminish criticism of the dolphin killings in Taiji or the fact that the dolphins are fighting for their lives as they are chased to their deaths by eager fisherman. We empathize with the dolphin’s pain as biological similarities abound. Like humans, dolphins are social creatures. They give birth, they breathe air and warm blood flows through their veins. Someone more spiritual than myself may say that there is a primal connection between dolphins and humans that evokes something sacred in us. While I wish the heartless killings of dolphins would end, the cynic in me can’t help but wonder how that will ever happen. One would think it is much easier to convince humans that killing other humans is unethical and morally bankrupt. But we live in a morally bankrupt, compassionless society, where our liberal president deploys drones, bombs weddings and kills scores of innocent children with scant public opposition. If we can’t put an end to these killings, how will we ever save the dolphins from those damn lethal pikes of Taiji? Nonetheless, perhaps dolphins can teach us more about humanity than we can teach ourselves. Perhaps dolphins can show us the true innocence of life and re-connect us to the natural world, in its wild state. Perhaps dolphins symbolize real freedom – freedom from our petty needs and material excesses. Ordinary people everywhere, including many Japanese, have voiced their outrage over the slaughter in Taiji. The conservation group Sea Shepherd and others continue to protest the killings and vow to one-day end the hunt. Their success hinges on whether or not tough international pressure can be waged, which in the end funds programs to transition these Japanese fisherman into new lines of work. Let’s join them. 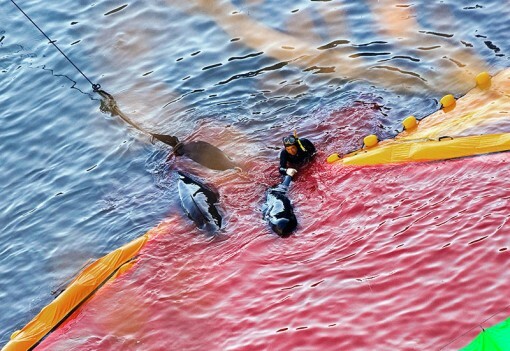 Until this happens, the dark red blood of innocent dolphins will continue to stain our souls and the sands of Taiji.